Sometime in December, maybe, is the word from PopCap. Peggle 2, the sequel to crazy PopCap success story Peggle, isn't going to be an Xbox One launch title. No doubt this will bring tears to the eyes of everyone enthralled by its enthusiastic E3 announcement - yes, that would be you there in the back - but if you were wondering when it will finally grace us with its presence, the answer is December, maybe. No, PopCap doesn't know when in December, or if it does, it's not saying. 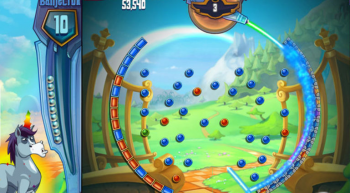 "Peggle 2 is a 'launch timeframe' title," says PopCap's Garth Chouteau. Launch timeframe, eh? Sounds like a term that couldn't confuse anyone, with the possible exception of Microsoft, which has Peggle 2 as one of the game titles available at launch for its Xbone. Mind you, so was Watch Dogs, and look how that turned out. At least, if Peggle 2 does hit that December window, it'll be available as a Christmas buy. That's got to be good for PopCap, so long as it does release as planned.